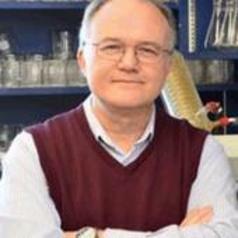 Dr. Weaver's research interests are focused on computer-aided drug design and medicinal chemistry with particular applications to chronic neurodegenerative disorders. His general approach employs a variety of theoretical chemistry techniques (molecular quantum mechanics [ab initio and density functional theory], force field calculations, molecular dynamics simulations) to design small molecules capable of binding to designated receptor sites; these small molecules are drug-like new chemical entities. The molecules are then synthesized using synthetic organic chemistry methods, and then evaluated to enable an iterative process of compound optimization driven by quantitative structure-activity relationship calculations. Dr. Weaver is applying this drug design strategy to a variety of disorders, including Alzheimer's disease (AD), protein misfolding dementia (tauopathies), epilepsy and stroke. In Alzheimer's disease, he is designing brain penetrant compounds that bind to beta-amyloid preventing its aggregation into neurotoxic oligomers. These agents hold beta-amyloid in a non-toxic conformation thereby blocking neuronal degradation. To date, his laboratory has devised three novel drug design molecular platforms as putative anti-aggregants. These agents have significant activities across a variety of in vitro and in vivo models of AD. In epilepsy, his laboratory is evaluating beta-alanine as an inhibitory neurotransmitter around which to design anticonvulsant agents. In addition to the design and development of drug molecules, Dr. Weaver is also interested in medical device development, specifically as related to the evaluation and measurement of human consciousness. For example, he has worked to develop a " consciousness scanner" device that can be used to clinically evaluate concussions and to determine the depth of a coma. In all of his research, Dr. Weaver is focused on both basic science and translational science. He has pioneered the concept of " micropharma" , and his work emphasizes the importance of hospital and university-based biotech companies to address the growing need for new innovative therapeutics for a wide variety of human brain disorders.